What is your favourite cut of chicken? Though I’m fond of all varieties, I tend to lean towards chicken breasts. I always have a few packages of boneless, skinless chicken breasts on hand. They are like a canvas just waiting for you to add your own unique twist or in this case, flavour. I like recipes that have simple, easy to find ingredients. 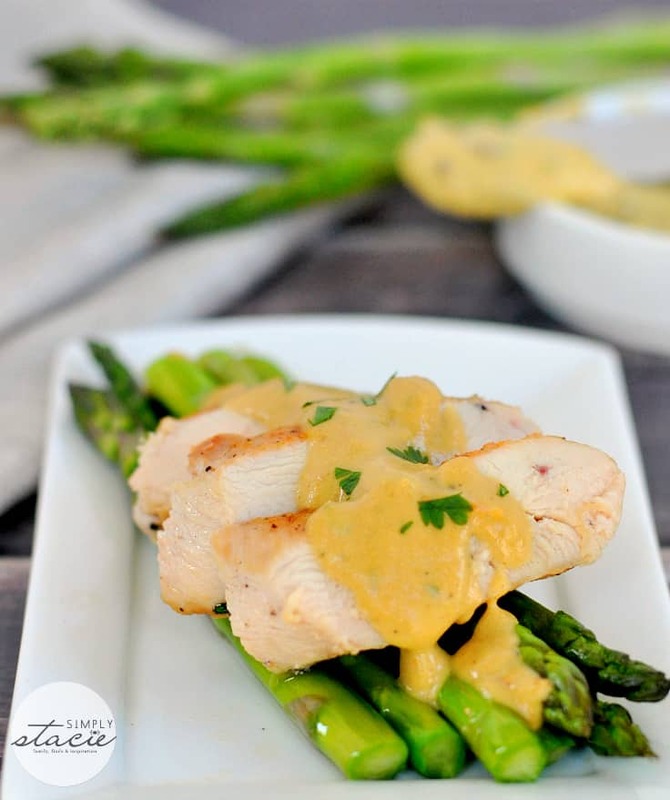 This recipe for Mustard Chicken is definitely one of those meals! 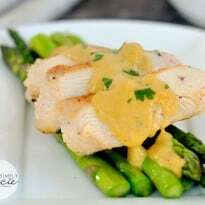 Here we have juicy, perfectly seasoned chicken breast topped with a creamy mustard sauce. The sauce tastes delicious paired with your veggie side dishes like steamed asparagus or broccoli. Use some fresh tarragon if you have it. If not substitute in dried tarragon, but I’d only use about 1/4 tsp instead. Impress your family with a restaurant quality meal without the hefty price tag! If you need to feed more people, just double (or triple) the recipe. This would be a great main dish to serve at a dinner party! For another tasty mustard recipe, check out my Brown Sugar Dijon Pork Tenderloin. I also have a number of easy chicken recipes you might enjoy like Lemon Herb Slow Cooker Chicken, Cheesy Chicken and Broccoli and Creamy Chicken & Rice Casserole. 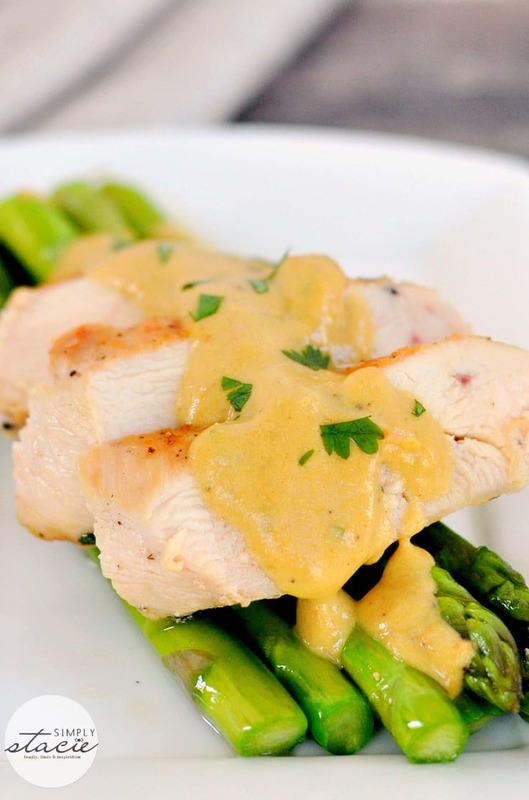 Juicy, perfectly seasoned chicken breast topped with a creamy mustard sauce. Season chicken breasts with salt and pepper. In a large skillet, heat oil over medium heat. Cook chicken breasts over medium heat for about 5-7 minutes on each side or until done. Remove from pan and keep warm. Thanks for the recipe, this sounds really good! Will have to try it out next time we have chicken! Your recipes have been put to use quite often these days, thanks for posting! 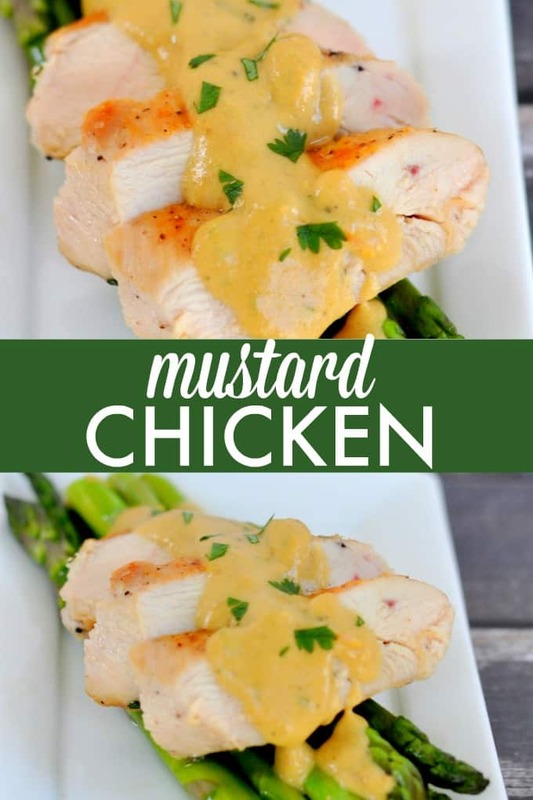 This is such a beautiful recipe and I love the Mustard sauce that it put on top of this chicken! 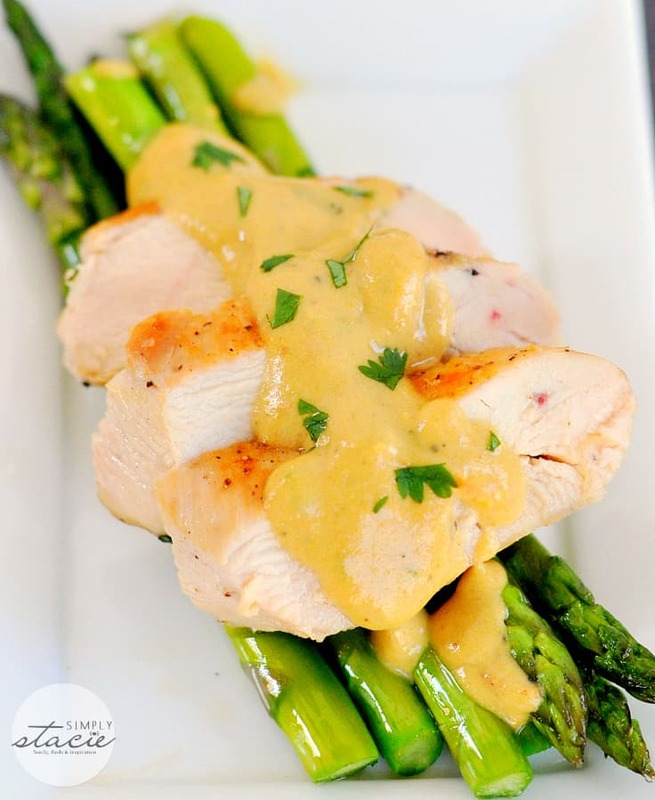 I will have to make this recipe, and I like that it is on top of asparagus! Mmmm sounds really good, nice to give the chicken a little kick of flavour!! What an creative use of mustard! I read your recipe for Easy Mustard Chicken and I thought it was easy indeed. I loved your presentation. Since we eat a lot of chicken, i like to try different recipes so we do not get tired of eating chicken. I love Chicken Pot Pie and Stuffed Chicken Breasts but chicken always tastes good to me. I love how you place the food in the photos.Are you a chef? Everything you post looks so delicious and tempting; like this chicken.Thank you for posting it. That looks absolutely delicious. Another recipe I need to try! I am always looking for new recipes for chicken. This recipe looks so easy to make. It really looks delicious too. I can’t wait to try it. Do you think I could exchange unflavored almond milk for the milk in this recipe? I’m not 100% sure because I haven’t tried it that way, but I think it would probably be ok to do! First off, I’d like to mention how fantastic these photos have turned out – super! I love my chicken breast, not too sure about the mustard so I’d just add that gradually to taste. This is definitely a much try recipe. Looks and sounds delicious. I always have chicken breast on hand. We have asparagus ever week. (more if on is on sale) Thanks for the new idea. Hi there! Visiting from Wow Me Wednesday. This looks so good! Thank you so much for sharing the recipe! Your photos are great! this looks fantastic! We’ve been using dijon for several recipes so I know I love the taste, our chicken has been BORING for a while now so I can’t wait to try this, it’s pinned and I’m awaiting dinner! 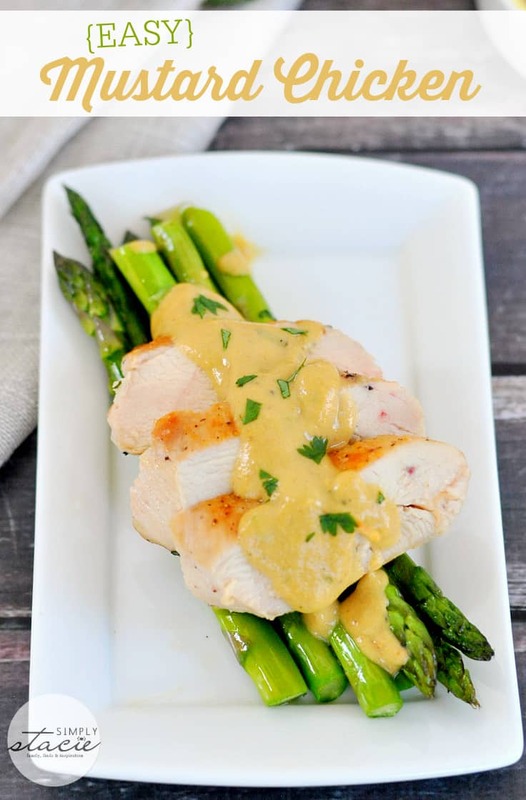 Your Easy Mustard Chicken looks amazing, I would love to have this right now. Thanks so much for sharing with Full Plate Thursday this week and come back soon! Sounds great & fits with my current diet plan! Pinned!! This looks like a yummy spring meal that I will have to try very soon. We don’t have a recipe, we usually fry chicken breasts with mushroom soup gravy, or just with spices. This sounds tasty and we love fast, easy dishes! YUM!!! This sounds delicious thanks so much! Def gonna try this one! Looks like a great fresh recipe for spring especially! I like that this recipe is easy and appealing. We like putting mustard on a lot of our dishes, will have to try this.